King in San Francisco, CA – ADOPTED! | Bull Terrier Rescue, Inc.
← Lucas in Livermore, CA – ADOPTED! 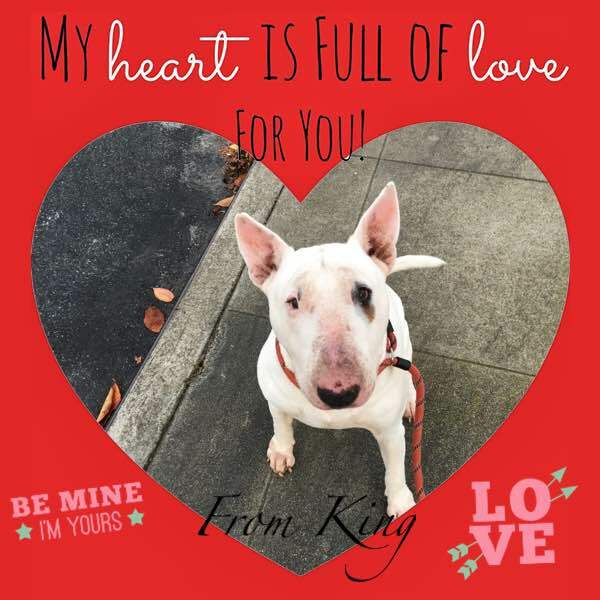 King in San Francisco, CA – ADOPTED! Dear King is so affectionate and eager to learn. This big guy lived with a Shih Tzu without any major issues. He was came into our rescue program when his former family’s Shih Tzu became ill and required extensive care so there was not enough attention given to King. King has been around toddlers and special needs adults without any issues. During our walks, he perks up when he sees children and will gravitate toward them. He has been fine with our female dogs and will meet the males after he is sufficiently recovered from his 2/18 neuter. King is 68lbs; and he is crate, leash and house trained. If your information is not yet on file, please complete our application which can be found here: http://www.bullterrierrescue.org/?page_id=572. This entry was posted in Adopted by Susi Ming. Bookmark the permalink.